The PESA Human Resources and West Texas Steering Committees hosted a roundtable on Attracting Talent to the Permian Thursday, October 11 at the Petroleum Club of Midland. With the Permian as the most active area in the industry, PESA created as opportunity for discussion around employment in West Texas. 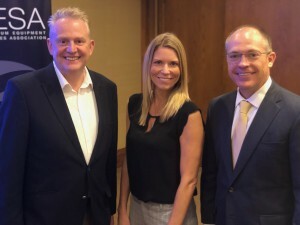 Brent Hilliard, Chairman, Midland Development Corporation; Aleek Datta, Managing Director, Accenture, and Chad McAllaster, Vice President – Permian, Anadarko, addressed PESA members on the topic of developing a value proposition to attract skilled employees to the Permian. Roundtable participants representing companies with Permian operations shared their top employee recruitment and retention issues, such as shortfall and the high cost of housing and childcare, low P-12 school ratings, high household utility costs and absence of social activities. Because of these realities, the PESA HR committee is focused on providing members an opportunity to share best practices and discuss solutions. Chad McAllaster, Vice President – Permian, Anadarko, discussed multiple staffing strategies Anadarko has successfully executed. Anadarko moved 200 families from Houston to the Permian over a six-month period. Many Anadarko employees had challenges securing bids for homes, building homes in a timely manner, finding childcare and decent schools, and healthcare was a 6-12 month wait. Although, he said Anadarko employees are realizing the benefits of more family and personal time because of shorter commutes and better quality of family life. Since then, Anadarko outsourced a company to build a man camp with 500 beds for Anadarko employees and contractors. Radiuses have been established for three shifts, 14 days at camp/14 days at home, weekdays at the camp, and daily commuters. For healthcare, many employees are able to receive immediate healthcare through video conference programs. Anadarko has also partnered with a local daycare to increase childcare options, and thirty-four of Anadarko’s employees serve as teachers through the Junior Achievement Program to improve the quality of schools. To mitigate the fear of layoff due to the cyclical nature of the business, Aleek Datta, Managing Director, Accenture, discussed smarter recruiting. Offering new employees transferrable skills allows employees to have confidence in a downturn that their skills are transferrable to other roles and industries. Datta also discussed smarter recruiting through the use of technology. Websites such as LinkedIn can help employers mine resumes for competencies that could be transferrable from other industries. He added that understanding and managing workforce needs then creating online courses to reskill employees and have training available for free combined with practical training is an opportunity to maximize efficiency for business needs. In addition, potential employees need income and can’t take time off of work to train. Allowing new employees to obtain the needed skill as part of their job would be attractive. Chairman of Midland Development Corporation (MDC) Brent Hilliard discussed the complex problem from an economic development standpoint. With the cyclical nature of the industry, demands for employees have fluctuated over the years leaving low-confidence in non-industry companies that make the community whole such as, hospitality, medical, childcare and housing companies. The MDC is focused on the topics of employee housing, affordable and available childcare, improved healthcare and educational systems. MDC is also working on creating a residential community in Midland similar to The Woodlands. This would be a master planned community for an estimated 60 residences. The community is designed to include schools, daycare, and street lights, among other features. MDC has identified a national recognized childcare organization willing to partner with a company to build childcare facility that will accommodate 200 – 300 children in exchange for a long-term (possibly 3-year) contract. This organization is already operating in Midland and will build as many as requested. Participants discussed the possibility of family camps in addition to man camps; best practices recruiting talent into the Permian; and strategies to recruit female talent. PESA hosted a luncheon in Midland October 17 to dive deeper into the topics of education, road safety, workforce development, healthcare and housing.